A new look for the New Year, Nivea embrace a re-design. Known for their reasonable prices, cult packaging and hardworking formulas – Nivea has been loved by women since the brand began 101 years ago. Classic products such as the Nivea Crème and Lip Butter tins have become staples for women everywhere, all recognisable by their beautiful packaging. The brand have just revealed exciting news that they will be getting a packaging makeover by the renowned, sustainably-focused designer Yves Béhar. 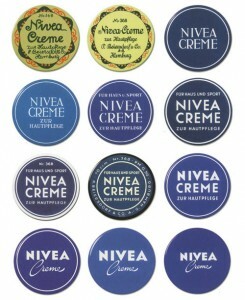 Nivea say the re-design was needed after the brand experienced a massive growth, leading to a visually confusing series of options for consumers. Designer Yves Béhar made around 30 trips to Germany to meet the brand in order to learn more about their history. Staying respectful to Nivea’s heritage and trying to celebrate the time they were at their purest was of great importance to Béhar. With this in mind, the new logo is set to contain the brand’s signature blue colour in a circle with Bauhaus-inspired lettering to emulate Nivea’s classic tin packaging. This will appear on all products and will require the reproduction of packaging for the entire 1600 part product line! As well as taking Nivea back to its aesthetical roots, the re-design will involve less packaging, optimised transportation and fewer shipping materials. If you fancy pampering your skin, why not try a facial? Take a look at our fact sheet on Facials for more information. Read the full Nivea story over at Grazia.